First I started to develop the base game. At this point I didn’t think about including any kind of figures for the game. My only goal at this point was, to program a challenging game. One day I got to the point where the base game was finished and I had to polish up the game with great graphics. At this point I began to think about how the game should look at the end. First I had the intent to give the game a really simple look – no figures, no special graphics. I spoke with some guys about my idea and they were not really happy with this concept. They thought that this game has much more potential. So I stopped and began thinking again about design. Through the thinking process I remembered something that I learned some years ago. Now it was clear, I need to do exactly that. I found the character very fast. I was sure that a middle-aged plumber would fit perfectly. The man should be dressed like a stereotypical plumber. Now there was the plumber, but what should this man do? What has this man got to do with the game? I was sure that this man needs a good small story. As I said, a good story helps the player immerse himself into the game. 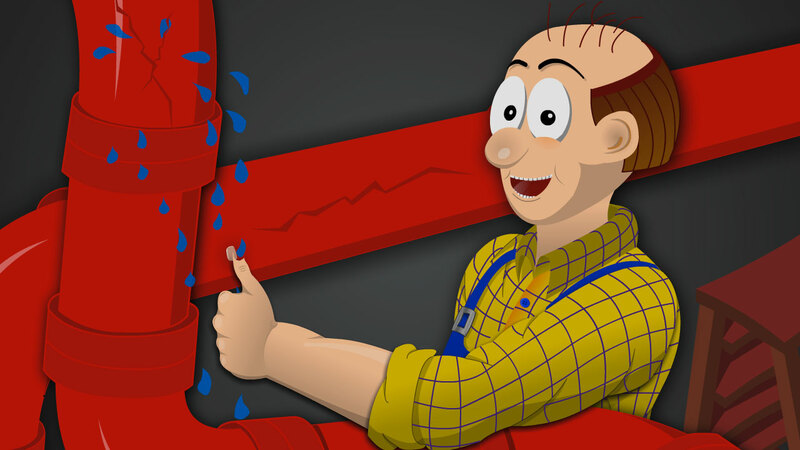 Ok, I created the following story: The plumber is a master plumber and he has very much to do with repairing a lot of broken water systems. The water systems are so damaged that he urgently needs an assistant, to help him in this task. And at this point the player becomes part of the story by assuming the role of the apprentice. Now that there exists the master plumber with his story, it is time for him to become a real shape. For me it was clear, that the plumber should become a comic look but without black outlines. I think that elimination of the outlines will made the art fit better to the water pipes of the game. Further the man should always look friendly but also a bit confused. Simply a master plumber that really needs help! Julia began to draw some sketches of possible shapes for the plumber. She created many humorous sketches. Here are some examples of the sketches. After a lot of drawing, we finally found the perfect shape. He looks friendly and very sympathetic. As next step I began to work out from the sketch the final art. For this purpose I have used the program Adobe Flash. It was very though, because I used this software for the first time for this purpose. It worked very well, but the program crashed really often, so I’m not sure, if I will use it again for the next project. For all that, finally I got the final result of the nice looking plumber. The master plumber is born!